I wrote a post recently about how the term evangelical seems to have been co-opted and caricatured to the point where it has almost become meaningless. And possibly even detrimental. This came out of ongoing conversations with friends, representing a variety of denominations and age demographics, about whether or not the term evangelical could possibly be redeemed. More than once, we’ve sadly lamented that it’s probably better to dump the word altogether. Irredeemable. Beyond hope. Deep-six that sucker. Ghost the term. If having an honest conversation is the goal, then the term evangelical becomes a door-opener. If people are just looking for a quick way to write you off, and they have a stereotype caricature inaccurate understanding of the term, well… that was never a conversation in the first place. The graphic at the beginning of this post is a good summary, and I like providing solid explanations in a visual arts medium (you can find a larger copy here). But at the same time, it’s full of a lot of insider-jargon that could make any conversation over coffee long and one-sided. I would probably insist strongly recommend that you put it into your own words, so you don’t sound like an encyclopedial parrot. For starters, you don’t need to call it a ‘quadrilateral’ or give a biographical sketch about who David Bebbington is. The Bible is a Big Deal: when its teachings and my life don’t match up, guess who needs to change? Jesus was crucified so we can have life. Yes, He loves us so much, that He would voluntarily go to that extreme. Nobody is “born” a Christian, you have to make a choice to surrender to Jesus. And keep surrendering (that’s ‘discipleship’). Faith in Jesus is a private decision that is expressed in the public square. By serving, not by being obnoxious. However you might choose to put it into words, I think it’s time for those of us who are evangelical to stop playing possum when people misrepresent who we are and what we believe. 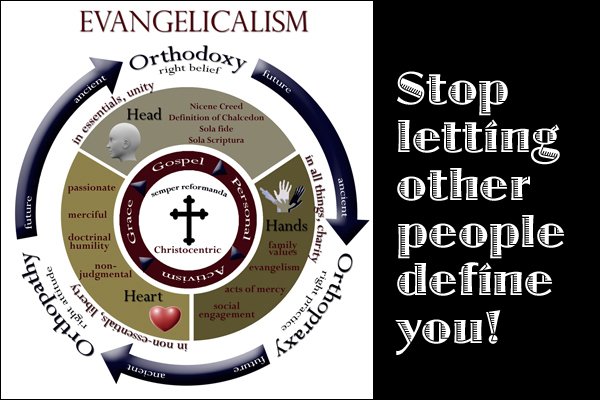 So when you hear somebody make a comment about “typical evangelical” and you suspect they don’t really know what the term means, why not invite them into a conversation about it? Buy their coffee.